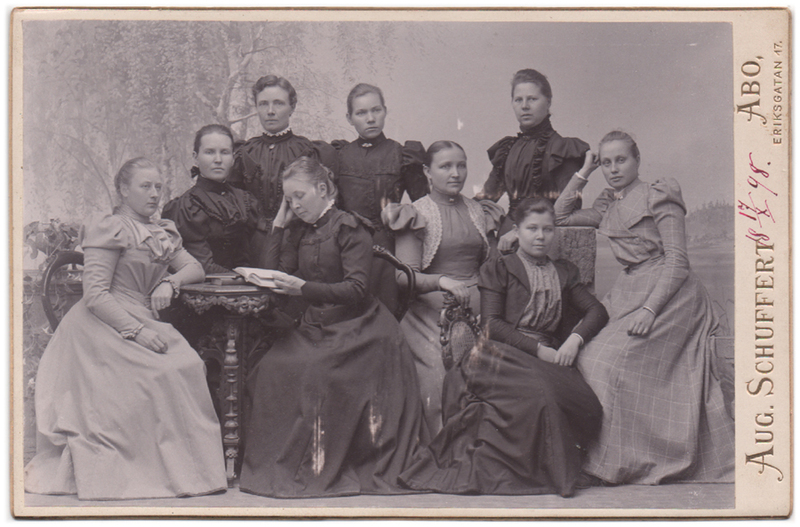 A photograph on nine unidentified women posed together as a group. All except for three are sitting. Most of the women look straight at the camera: two have directed their gaze to something else, and one appears to be focused on reading a book. No information remains of the identities of these women or how they knew each other. However, a date has been written with red ink on the bottom of the picture: “18 17/X 98.” – October 17th, 1898. It’s probably reasonable to assume this is the date when the picture was taken. The photograph has been taken by August Schuffert in Turku, Finland.